Whilst I don't follow a paleo or grain free diet (or any diet really - other than not eating what kills my stomach :P), I love experimenting with recipes and coming up with new ideas that suit a variety of dietary needs and choices. I've been getting lots and lots of emails from you guys asking for more paleo or grain free recipes (especially because our Healthy Paleo Banana Bread Recipe is so popular!) 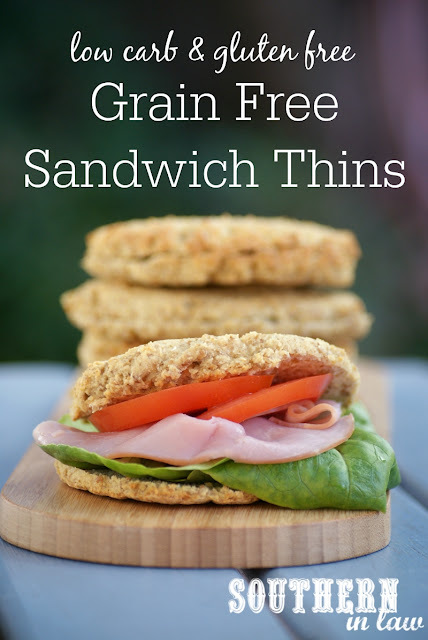 and after thinking about the types of recipes I could come up with, I decided there was one thing the paleo/grain free world was lacking; a bread recipe that's perfect for sandwiches! 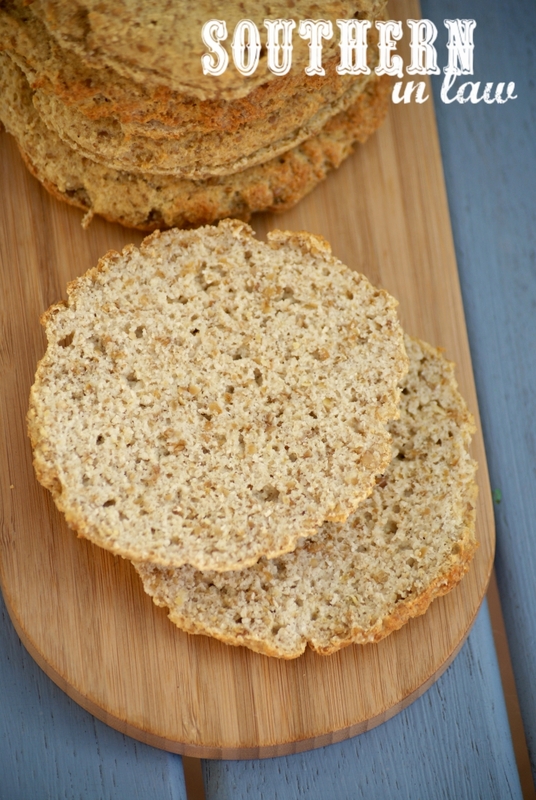 You see, I've tried quite a lot of paleo bread recipes and whilst I've tried some delicious versions, I often find that these breads are really heavy - and I don't know about you, but that's not something I want for a sandwich. 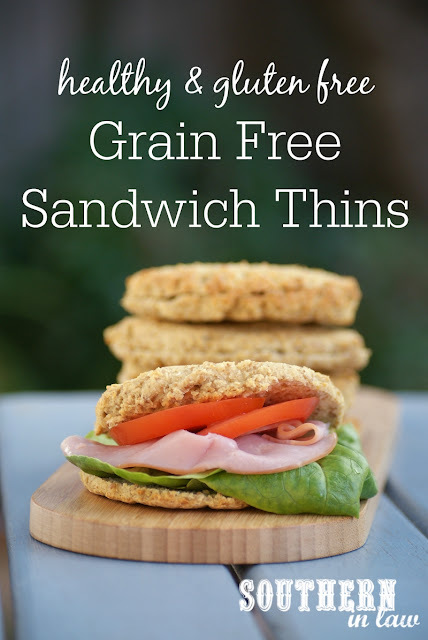 I'm someone who likes to focus on the fillings in sandwiches more than the bread on the outside and that's why I loveeeeee sandwich thins and wraps. 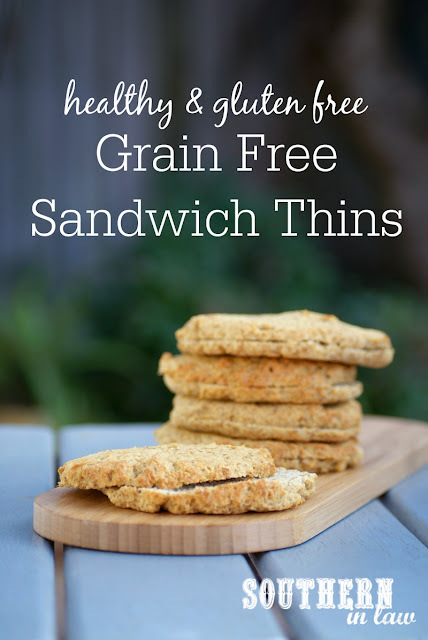 I've been making our Homemade Gluten Free Sandwich Thins Recipe for quite some time and I decided it was time I came up with a grain free version. After quite a bit of testing, tweaking and playing around with ingredients, I came up with the perfect healthy grain free bread recipe. Now, I don't know if it's officially paleo because I always find that people have different things they "allow", but it certainly is free from any sort of grain and it really is all sorts of delicious. These Grain Free Sandwich Thins are super simple to make and taste amazing. I've been loving them with everything from ham or chicken and salad to simply filling them with cream cheese or nut butter - the possibilities are endless because they work with both sweet or savoury fillings. They're a little bit nutty in flavour, soft in the middle with a crispier crust when they're first baked (they do soften up after a day or so but if you like them crunchier, just pop them in the oven for a few minutes!) and can be frozen and kept on hand for whenever you're in need of a sandwich-filling vessel! Combine your almond meal, flaxmeal, protein powder, cream or tartar, eggs, egg whites and coconut oil in a large mixing bowl. Add in your coconut flour and 1/2 cup of boiling water, stirring to combine. Spoon your sandwich thin mixture out onto your baking sheets, flattening out to your desired size. They will rise slightly, however, you don't want to flatten them out any less than 1/4 of an inch/1/2 cm in thickness. Bake for 15-20 minutes, depending on size. You'll want to take them out of the oven once they are firm to the touch and cooked through. Allow to cool before slicing with a sharp, serrated bread knife. These sandwich thins will keep for 3-4 days, stored in an airtight container. On the day they're made, they'll have somewhat of a crust on the outside, however, they will soften up over time. If you'd prefer them crunchier, just heat them up in the oven for a few minutes before eating! But tell me, what's your current favourite sandwich? And what's one food you wish you could make healthier or make to suit your dietary needs? I'm currently obsessed with toasted ham, cheese and avocado sandwiches because it is SO COLD!